Last night was a very interesting night in terms of racism. Or was it real racism? I can’t really tell since I am not sure what is considered racist or not anymore. As you can see from the above clip, Shaquille O’Neal decided to call David Lee the “White Chris Webber” and everyone has a laugh. But I started to think about why it was OK to laugh at it. Is it OK to bring up Lee’s skin in bringing up a nickname? If I played basketball, I wouldn’t want to be called the “Yellow Chris Webber” or anything like that. I would find that racist. Then that takes me back to when Kobe Bryant was nicknamed the “Black Mamba” by Nike. Everyone thought that was cool but I sat there wondering why they had to call him the black mamba. Was it necessary to call him that? Why not just call him the mamba instead of choosing the black mamba? 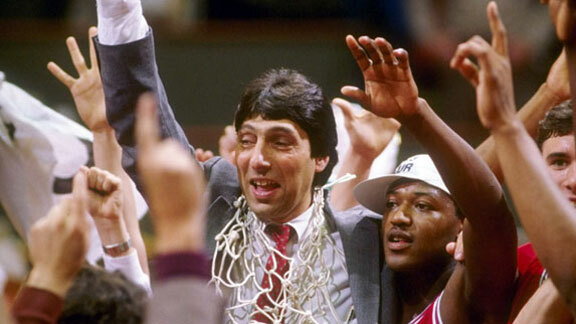 Jimmy Valvano celebrating the 1983 championship. The great coach Jim Valvano has inspired a lot of people over the years. Since his passing of cancer in 1993, memories of his celebration in the 1983 NCAA tournament and his speech at the ESPY’s a couple months before his death have inspired people. The Jimmy V Foundation has raised awareness and funds for research to find a cure for cancer. And to honor him, the NCAA have an annual Jimmy V basketball tournament. He was truly one of the most beloved people ever in college hoops. NC State, the school he coached, decided to honor him with something that I think may be the best looking tribute I have ever seen in any sport. Growing up as an A’s fan, the Yankees were public enemy number one. I hated everything that was all Yankees. But over the years, as I watched more Yankees baseball as the enemy, I really grew an appreciation for two players. One was Derek Jeter. The other is birthday boy Mariano Rivera. This isn’t the end for Alex Smith in San Francisco. The 49ers still need him. Colin Kaepernick needs him. Head coach Jim Harbaugh just announced that Colin Kaepernick will start for the third straight game for the 49ers. That means Alex Smith will once again sit on the sidelines and watch the second-year quarterback lead the team. Smith will have to watch his future with the 49ers slowly disappear. Unlike a lot of people, I actually don’t think that Smith has played his last snap for the 49ers. The 49ers still need Smith’s presence as the backup. Kaepernick needs his veteran to help guide him. Don’t expect that this is the last time we see Smith under center for the 49ers this year. A part of me feels that this is similar to the 2001 Patriots team. Somewhere down the line, the original Week 1 starter will return late in the season to save the team. It could happen again for this 49ers team. The team knows that they have two capable quarterbacks on the roster. Players have said that it’s good to have two players that the team trusts to lead the team. And ultimately, that’s a good problem to have. But it’s a problem that could have been avoided and Smith would have never lost his starting job. And Smith knows that he blew it. This is pretty funny and I am glad that wrestling belts are still cool to have around. I need one. When he isn’t slaying the Dallas Cowboys secondary, Robert Griffin III is talking to the media, getting in his playbook, or preparing to ruin an opposing defense. Yesterday, he took time out of his schedule to make a pre-recorded appearance on WWE’s Monday Night Raw. 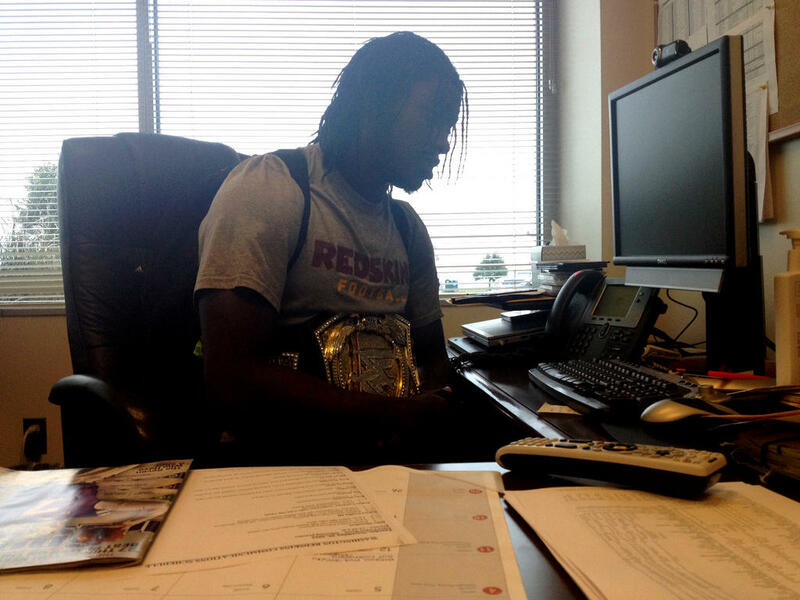 Through a website called 4th and Pain (operated by Redskin teammate Adam Carriker), Griffin was presented with a WWE championship belt. The funny thing about my blog name is that it is named after a common phrase athletes use during interviews when they try to explain the end result of all their hard work. Phrases like “It is what it is” and “One game at a time” is used so much that one day I really wish an athlete would just something so completely nonsensical that it just confuses everyone. Seriously, wouldn’t these phrases be more fun to hear during a postgame press conference? No way Harbaugh is going to choose Smith over Kaepernick now, right? After yesterday’s 49ers game, I sat at work pondering what direction this team is going. Despite being 8-2-1, the team may look great with the record but their quarterback situation still has me confused. Granted, winning solves everything and I am pretty sure coach Jim Harbaugh has that all figured out in his head what to do with it, but is the answer so obvious that we are trying to ignore it? If you saw the game yesterday, you saw Alex Smith with his helmet on essentially throughout the entire game. Smith stood on the sidelines ready to enter. It was clear that he was physically ready to play. And logic suggests that if your starting quarterback is healthy, you play him. That was the case but Harbaugh decided to give backup Colin Kaepernick another start. Now does that mean Kaepernick is #1 on the depth chart?